Happy Valentine’s Day from Sasha Shangri-La !!! 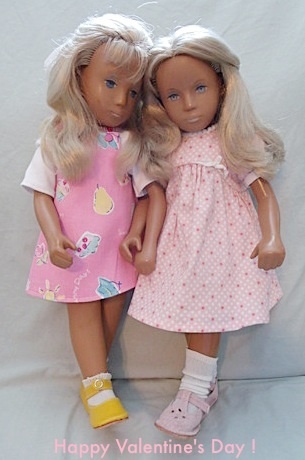 Faith and Ellen are dressed in their Ruth’s dolls outfits and send Happy Valentine’s wishes to you today! Carney and Faith wearing pretty pink outfits received in Sasha Valentine’s swaps several years ago. Jean Jensen shoes make for happy feet. Thanks for the Valentine wishes and the same to you and these four very pretty and delightfully dressed girls. I love Valentine’s Day since grade school days when we made our cards and shared with everyone. The chocolates were nice too! Happy Valentine’s Day to you too. Your girls look cute in their pretty outfits. Happy Valentines Day to you and your lovely girls too Ginger! I hope you enjoy today and your weekend too. PS Love how the little girls are dressed, so fresh and bright! Thanks Dee!! Hugs coming your way too xxxx. Happy Valentines Day Ginger and family! Love the girls they look so pretty in their gorgeous dresses.